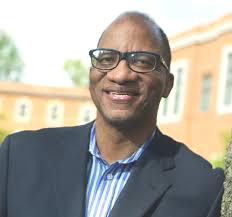 Journalist and author Wil Haygood credits Upward Bound with giving him the foundation to succeed in college. Nervous but determined, the 15-year-old boy walked into a conference room in Columbus, Ohio, for a fateful interview. If it went well, perhaps he’d have a chance to be the first member of his impoverished family to attend college. At stake was a place in Upward Bound, founded as an experimental program in 1964 as part of Lyndon B. Johnson’s War on Poverty, with a goal of helping students from low-income families get a college education. Haygood flourished during three summers in the federally funded program and credits the professors there ― and their tough-love approach ― with girding him to succeed in college. In all, more than 2 million people have participated ― studying English literature and composition, math and science, and getting practical advice on college admissions. Upward Bound alumni include Oprah Winfrey, actresses Viola Davis and Angela Bassett, ABC News correspondent John Quinones, and Democratic political strategist Donna Brazile. “It’s a 50-year-old program that continues to pay back ― giving us hope, and teaching so many lessons along the way,” said Maureen Hoyler, president of the Council for Opportunity in Education. The nonprofit council, formed in 1981, represents more than 1,000 colleges and agencies that have supported Upward Bound and its affiliated programs. One of the keys to Upward Bound’s success is that its local programs are conducted at college campuses, whether it’s after-school and weekend sessions during the school year or residential summer programs. “The fact that we get to live on campus is really cool — it gives you an idea of what college is like,” said Ruthy Pierre, a 16-year-old New Yorker attending a second summer of Upward Bound. Her program is run by John Jay College of Criminal Justice and hosted during the summer by the College of Mount Saint Vincent on a verdant campus in the Bronx overlooking the Hudson River. Ruthy, of American and Haitian descent, lives with her single mom and will be a junior this fall at Information Technology High School in Queens. She aspires to be a lawyer, but hasn’t ruled out a mid-career switch to being a chef. Among her 56 classmates in the six-week summer program was Corinne Lopez, 15, who hopes for a career combining her interests in graphic arts and forensic science. Her parents came to the U.S. from South America with college educations, but have struggled to find commensurate jobs in New York; Corinne’s father works as a doorman in Manhattan. “How do you do more with less?” asked Maureen Hoyler, describing a budget-related struggle to recruit and train professional staff capable of overseeing the academic program and providing advice on how to get into college, pay for it, and flourish while there. She said Upward Board’s role in college guidance has become increasingly crucial as many of the high schools supplying students to the program have cut back on their own guidance efforts. Lois Vosika-Weir, who grew up in a low-income housing project in Minneapolis, is among many Upward Bound alumni with an abiding gratitude to the program. Her mother had four children by the age of 24 and was pregnant with a fifth when her husband deserted the family. When she started the program as a ninth grader in 1974, she was reading at a fourth-grade level. Yet she was warmly welcomed. “It sounds clichéd, but the adults met me where I was at,” said Vosika-Weir, whose voice cracked with emotion in a telephone interview as she recalled those days. The support never wavered, even when she became pregnant as a 16-year-old. She was accepted at the University of Minnesota, got her bachelor’s degree, went on to get a master’s degree in psychology, and now, at 55, is an assistant principal at the American Indian Magnet School in St. Paul. Her three children all have college degrees, including a son pursuing a doctorate in physics. Likewise, Haygood remains volubly grateful for Upward Bound, even to the point of choosing to write a biography of African-American politician/pastor Adam Clayton Powell Jr. in part because of the congressman’s role in establishing the program.